“Green, please . . . ?” I said, somehow questioning my own reply. Without a closing remark, she turned abruptly to Mr. Hot. “You?” she said. Mr. Hot was trained as an MP and knew how to handle this with brevity. “Number 29 with beef.” And that was all. She turned and went off to the kitchen. For the past month I’ve been all Thai’d up, visiting several different Thai restaurants a week, finding the good, the bad, the exquisite. A well-respected food aficionado (read: Lou Palma), recommended I visit Brookside Thai in Bloomfield. A warm, cozy spot on Broad Street, complete with the requisite Thai decor, Brookside is definitely among the good Thai restaurants. Thai lunch menus tend to be a bargain. At Brookside, all dishes on the lunch menu are $6.95 and offer a choice of chicken, pork, beef, or vegetarian. It wasn’t until my third visit, on a weekday afternoon, that I encountered my earlier described, Seinfeld-esq character. To be fair, now that I've got my act together, she seems to have mellowed a bit, but invariably directs me away from the $6.95 lunch specials, and in the direction of the regular entrees. But onto the food! 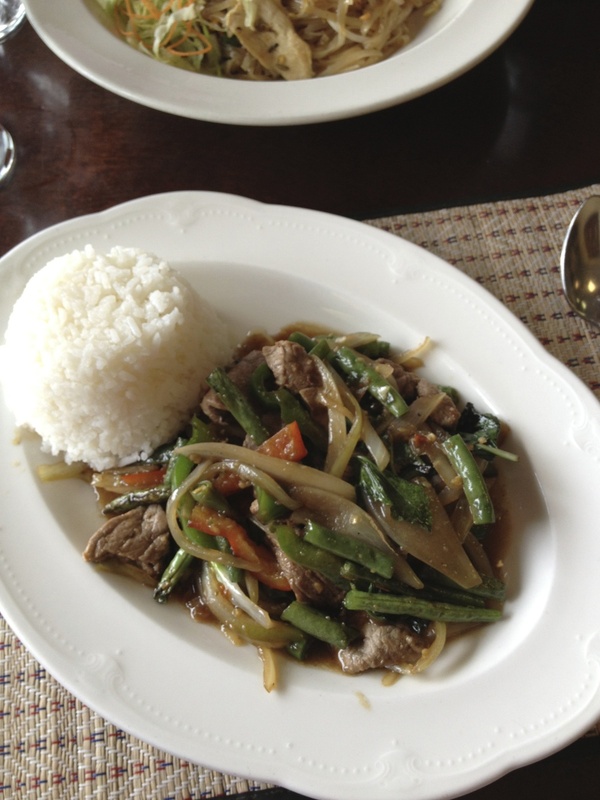 The most reliable litmus tests for Thai restaurants are dumplings and Pad Thai. 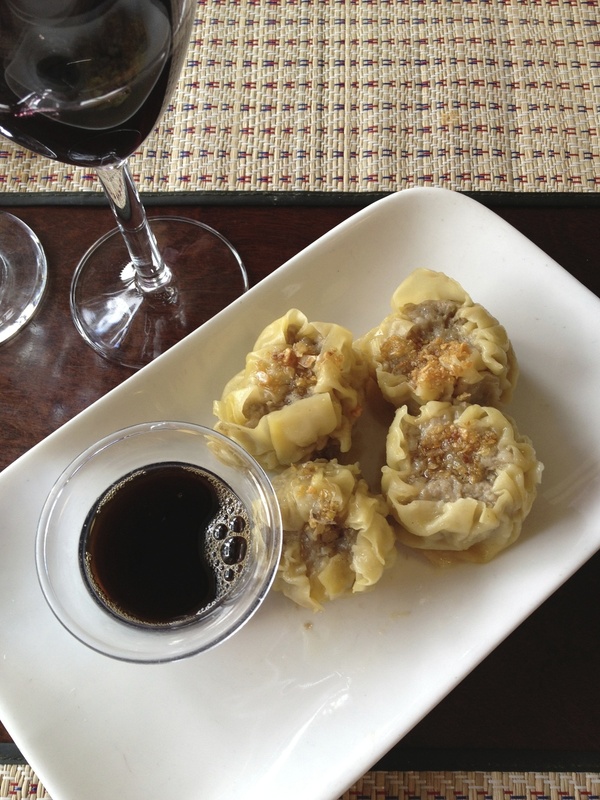 At Brookside Thai, I began with Kanon Jeeb ($4.95), Thai steamed dumplings with marinated shrimp, pork and mushroom. Presented as fluted, open-top cups, the wrapper was a delicate sheath that allowed the clean bite and flavor of the meat to be the centerpiece of the dish; not disguised in a superfluous wrapper. A must have! Pad Thai, a staple of American Thai restaurant menus, can vary enormously from restaurant to restaurant. A savory heap of stir fried rice noodles with scallions, egg, bean sprouts, and a nearly juvenile addition of crumbled peanuts, good Pad Thai could be an undeniable crowd pleaser when balanced. But it's quite the opposite when the delicate noodles are unbearably oil laden, or lacks crunch or scallions. 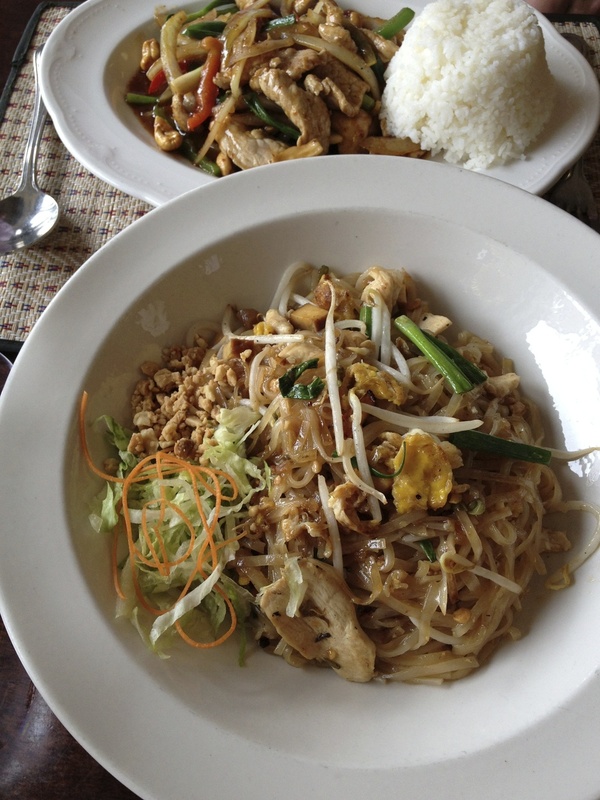 Brookside’s Pad Thai is balanced, neither too light nor too heavy, deeply flavorful, crunchy, and intensely satisfying. Two of my favorite dishes at Brookside are selections from the regular menu. Gang Ped ($8.95), red curry with chicken, pork or beef, cooked in coconut milk, with bamboo shoots, eggplant and fresh basil, and Gang Keaw Wan ($8.95), served the same way but with a green curry. Luxurious coconut milk plays the perfect foil to the capsaicin laden curry, leaving one in a pleasure-pain state, exhilarated and wanting more! Duck with Basil is a special that should doubtless be indulged. 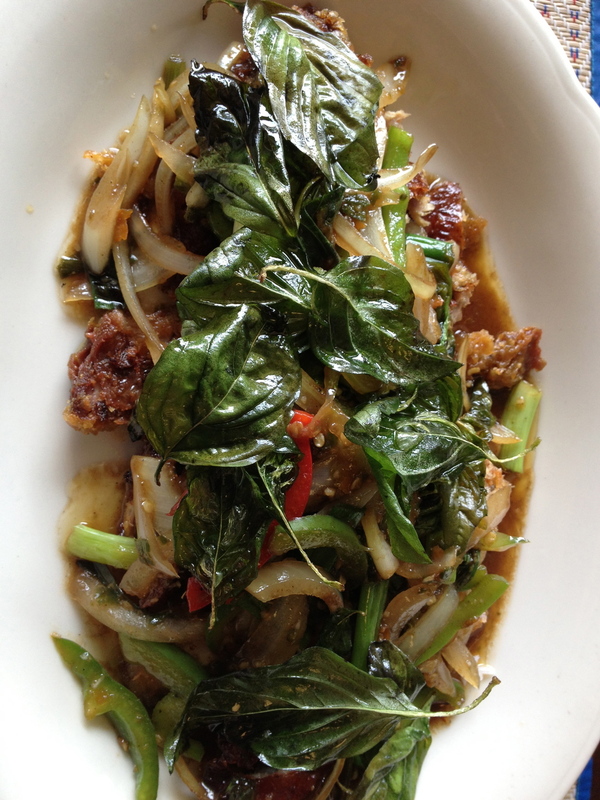 Crispy, rich, jouth-coatingly glorious, and rife with crispy Thai Basil leaves, this dish leaves nothing to be desired.